The story of how a school in Philadelphia, Orlando United Day and international organizations came together to bring HOPE to Manchester. Tragedy strikes in Manchester, U.K. at an Ariana Grande concert. Stars of Hope begin plans to spread hope to those impacted by this horrific attack. Sungard Availability Services in Philadelphia wants Manchester to know they are thinking of them and decide to do a Stars of HOPE project with the students at Bodine High School for International Affairs to create inspirational messages for Manchester. In the same timeframe, Stars of HOPE was invited to participate in Orlando United Day, a day of love and kindness to honor the memory of the 49 innocent Pulse victims on the one-year anniversary of the nightclub shooting. Survivors, friends, family & visitors of all ages attending the Pulse Memorial painted messages of hope and healing. Over 800 stars were created, and the painting only stopped when it started to pour! Thanks to a generous donation from DENTON’S, Stars of HOPE was able to bring volunteers from the US and Canada to Manchester to spread hope throughout the city. New York Says Thank You Foundation board member, Suzanne Bernier, connected Stars of HOPE to U.K.-based Dr. Liz Royle, Director of KRTS International, a globally-recognized author & trauma psychotherapist, with clinical experience working across the full range of psychological trauma (be that responding to traumatic incidents or working therapeutically with PTSD and historical trauma). 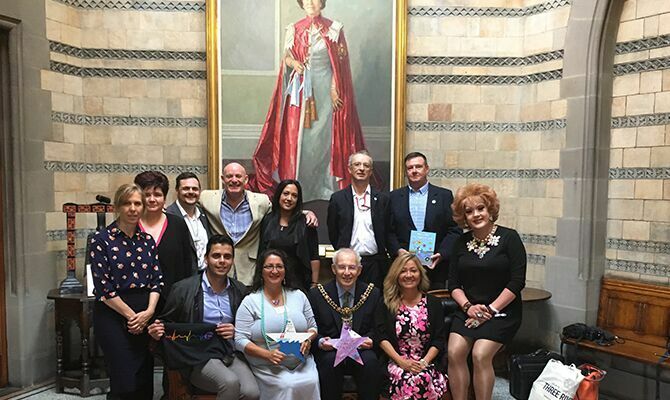 Over a whirlwind three-day visit, Dr Royle arranged for the group to meet, present and/or hang Stars with the Manchester LGBTQ community, first responders working near London’s Grenfell Tower, London Bridge, Greater Manchester Police Service, Manchester Paramedic Services, as well as a memorable visit with the Lord Mayor of Manchester, Councilor Eddy Newman.